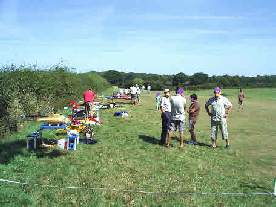 We are a friendly club with around 50 members operating from a site close to Uckfield in East Sussex, near to the beautiful South Downs on the South coast of England. We are affiliated to the British Model flying Association (BMFA). Our priorities are to fly safely and responsibly, to have fun and relaxation, and to further personal development through learning new skills. We fly radio-controlled model IC and electric fixed wing aeroplanes, helicopters and gliders, seven days a week. All our IC engine models must pass a strict noise test. Members are offered self-paced instruction for progression through a range of competency training & accredited examinations. Young novices are encouraged, and the club is able to offer instruction for achievement schemes counting towards the Duke of Edinburgh’s Award. Please click here for further details or contact the Membership Secretary should wish to be considered to join us.